Ma'at is the Egyptian goddess of truth and justice. She is married to Thoth, and is the daughter of Ra, the sun god. In addition to truth, she embodies harmony, balance and divine order. In Egyptian legends, it is Ma'at who steps in after the universe is created, and brings harmony amidst the chaos and disorder. While many Egyptian goddesses are presented as tangible beings, Ma'at seems to have been a concept as well as an individual deity. Ma'at is not just a goddess of truth and harmony; she IS truth and harmony. Ma'at is also the spirit in which law is enforced and justice applied. The concept of Ma'at was codified into laws, upheld by the kings of Egypt. To the people of ancient Egypt, the notion of universal harmony and the role of the individual within the grand scheme of things was all part of the principle of Ma'at. "Ma'at is depicted in the form of a woman seated or standing. She holds the sceptre in one hand and the ankh in the other. A symbol of Ma'at was the ostrich feather and she is always shown wearing it in her hair. In some pictures she has a pair of wings attached to her arms. Occasionally she is shown as a woman with an ostrich feather for a head." I have not stolen that which belongs to the gods. "Ma’at is particularly ubiquitous in tomb art of individuals in the upperclass: officials, pharaohs, and other royals. Tomb art served numerous purposes within the funerary practice of ancient Egyptian society, and Ma’at is a motif that helps fulfill many of these purposes. Ma’at is an important concept that helped create a pleasant living space for the deceased, evoke everyday life, and convey importance of the deceased to the gods. 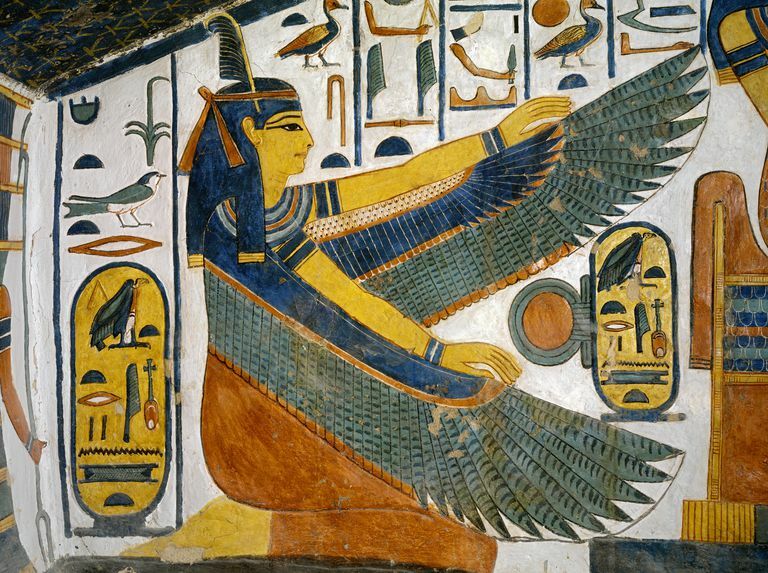 Not only is Ma’at essential in tomb art, but the goddess herself plays a pivotal role in the Book of the Dead." Honored all over the Egyptian lands, Ma'at was typically celebrated with offerings of food, wine, and fragrant incense. She generally did not have temples of her own, but instead was kept in sanctuaries and shrines in other temples and palaces. Subsequently, she did not have her own priests or priestesses. When a king or Pharaoh ascended to the throne, he presented Ma'at to the other gods by offering them a small statue in her image. By doing this, he asked for her intervention in his rule, to bring balance to his kingdom. She is often depicted, like Isis, with wings on her arms, or holding the feather of an ostrich in her hand. She typically appears holding an ankh as well, the symbol of eternal life. Ma'at's white feather is known as a symbol of truth, and when someone died, their heart would be weighed against her feather. Before this happened, though, the dead were required to recite a negative confession; in other words, they had to enumerate a laundry list of all the things they never did. If your heart was heavier than Ma'at's feather, it was fed to a monster, who ate it. In addition, Ma'at is often represented by a plinth, which was used to symbolize the throne upon which a Pharaoh sat. It was a Pharaoh's job to ensure law and order were enforced, so many of them were known by the title Beloved of Maat. The fact that Ma'at herself is portrayed as one indicates to many scholars that Ma'at was the foundation upon which divine rule, and society itself, was built. She also appears side by side with Ra, the sun god, in his heavenly barge. During the day, she travels with him across the sky, and at night, she helps him to defeat the deadly serpent, Apophis, who brings the darkness. Her positioning in iconography demonstrates that she is equally powerful to him, as opposed to appearing in a subservient or less powerful position.